On April 30, 1789, enthusiastic onlookers filled the streets, dangled out of windows, and perched on rooftops to catch a glimpse of George Washington as he made his way through the streets of New York to Federal Hall to assume the new office of President of the United States. As at many political events that would follow, there were vendors along the procession route busily making and selling souvenirs to commemorate the day. Among the items sold were small brass discs with shanks on the back, to be pinned or sewn onto clothing and stamped with “Long Live the President” and Washington’s initials, or American eagles. While those items had a very 18th century feel, they are not very far away. This desire to publicly declare one’s political views through some material form—to be worn, carried, or displayed in front of ones’ home—has continued unabated through today. To carry out this messaging in the pre-electronic media age required stuff. Today, once-ubiquitous pins and stickers have given way in some measure to partisan Twitter feeds and other digital means of expression. But the underlying impulse remains the same: Active participation in the democratic process beyond the ballot box for those lacking a podium or direct engagement with a campaign. 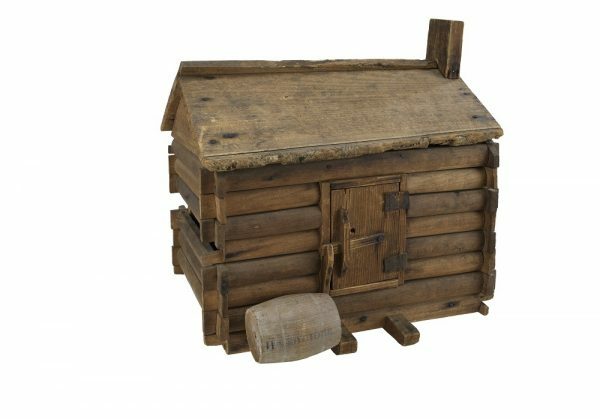 William Henry Harrison model log cabin, carried on a pole in parades by supporters. Historically, the most successful efforts captured the essence of a candidate’s character, appeal, or ideals through simple symbols and slogans. William Henry Harrison’s Log Cabin strategy of 1840 was the inspiration for many later campaigns. When a rival newspaper quipped that Harrison would be content to retire from the contest and spend his days in a log cabin drinking hard cider, Harrison flipped the disparagement to his advantage. 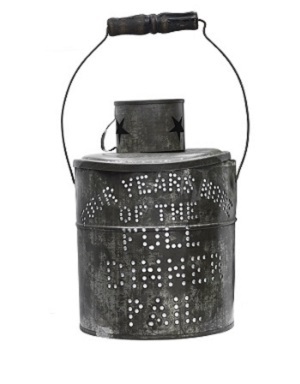 “Full dinner pail” lantern from McKinley and Roosevelt’s 1900 campaign. His campaign created canes with miniature barrel heads, lanterns in the shape of logs cabins, and ribbons and pottery plastered with their image. All of this aimed to lampoon his opponent, Martin Van Buren, as the elitist candidate of fine wine and mansions, while convincing voters that Harrison, who went on to become the 9th president, understood and would represent the interests of the common man. Not long thereafter, a lawyer from Springfield, Illinois, employed Harrison’s technique to good effect, creating the image of “Old Abe” Lincoln the rail-splitter. Supporters paraded with wooden axes and decorated local campaign headquarters with rails supposedly split by the candidate himself. Time and again, the creation—and romanticization—of simple symbols to convey a deeper emotional message won the day. For Williams McKinley’s 1900 re-election campaign, the 25th president deployed tin torchlight “dinner pail” lanterns. The candidate’s name was punched on one side and “Four More Years of the Full Dinner Pail” was punched on the other. For Teddy Roosevelt, it was paperweights and bandannas related to his founding of the Rough Riders, the first voluntary cavalry in the Spanish-American War. John F. Kennedy burnished his image as a presidential contender with photos and scale model replicas of PT-109. Kennedy was commander of the World War II Patrol Torpedo boat and led rescue efforts to save his crew after it sank. And, of course, we have the brass belt buckles and ten-gallon hats associated with Ronald Reagan, the quintessential self-reliant cowboy. 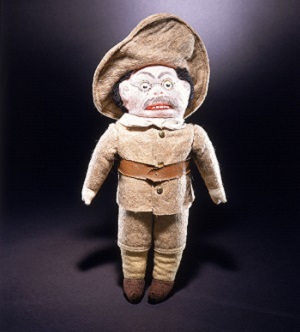 Theodore Roosevelt doll depicts him in his Rough Rider uniform from the 1898 Spanish-American War. These objects remind us that voting is intended to be not only deliberative, but also fun and full of spectacle. Campaigns and vendors eagerly supplied the party hats, noisemakers, and novelties to make exercising political rights a celebration. The stuff of politics also found its way into the home—if a campaign succeeded in getting a voter to ensconce a Roosevelt clock on a mantel or an Eisenhower potholder in the kitchen, you not only had that family’s support for one election, but their loyalty for generations to come. Our digital age has relegated many of these mainstays of campaigns past to a shelf in the back room. While media buys can be tested, the effect of buttons, stickers, and yard signs in increasing poll numbers is hard to quantify, and moving those numbers is now the name of the game. Nonetheless, we still harbor cravings for actual things, and the stuff itself continues to inhabit a special place in the campaign landscape. The current election, with its deeply partisan hats, t-shirts, and signs, demonstrates both the legacy and the need. These items create a visual whole that binds the candidate to their message—and to the voter—in personal ways that other forms of media cannot achieve. For these reasons the paraphernalia endures. It can be as meaningful to the voters today as the brass buttons were to supporters standing outside of Federal Hall, watching the first president inaugurated in 1789.
is chair of the division of political history at the National Museum of American History, Smithsonian Institution. Primary Editor: Sara Catania. Secondary Editor: Eryn Brown. *All photos courtesy of Smithsonian Institution.